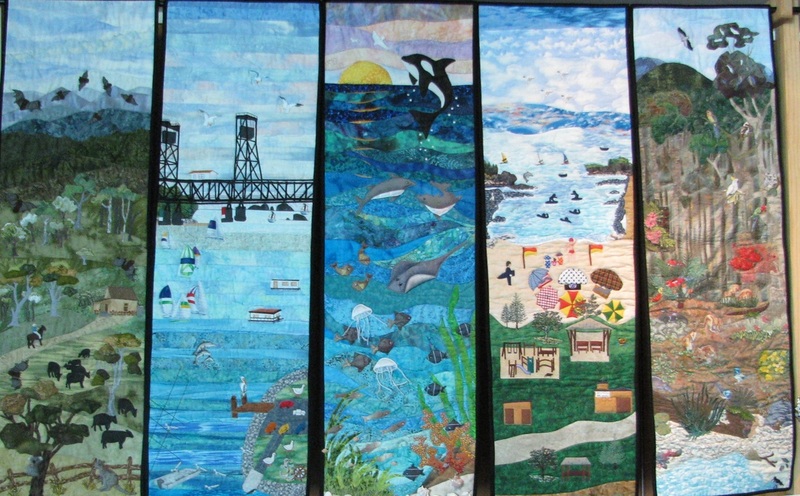 Five panel quilt created by Night Owl Quilters depicting scenes in Batemans Bay. Proudly displayed at the Batemans Bay Soldiers Club. ​We have created a new page! We have created a Blog Page so Night Owl members who are unable attend meetings can stay informed. Keep the date: Night Owl Quilters are hosting their Biennial Biggest Morning Tea, Tuesday 14 May 2019 at the Batemans Bay Soldiers Club starting 9.30am. Our group meets the second and fourth Tuesdays every month (9.30 to 12 noon) except over the Summer/Christmas holiday period. At meetings we enjoy sharing projects and have ‘Show and Tell’ sessions to view other’s masterpieces. We have a library to borrow quilting books, magazines and some quilting equipment. We provide and participate in inspirational demonstrations and workshops.﻿ Of course, we make time to chat and have a bit of a laugh. ​We contribute to the local community and raise much need funds via a Biggest Morning Tea event. We contribute and assist the South Coast and Country Quilters with their biennial Quilt Show. We also donate to needy local charities. Thinking of joining? Select the Join button below to obtain more information.